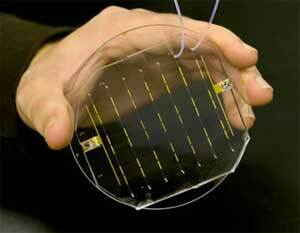 (Nanowerk News) A new technique in which single strands of synthetic DNA are used to firmly fasten biological cells to non-biological surfaces has been developed by researchers with the Lawrence Berkeley National Laboratory (Berkeley Lab) and the University of California at Berkeley. This technique holds promise for a wide variety of applications, including biosensors, drug-screening technologies, the growing of artificial tissues and the design of neural networks. Chandra is the lead author of a paper that appears in the Jan. 30, 2006 issue of the international chemistry journal Angewandte Chemie. The paper is entitled: "Programmable Cell Adhesion Encoded by DNA Hybridization." Many of the vast assortment of biological cells are naturally sticky, a property that enables individual cells to adhere to other cells and non-cellular components, which in turn enables them to assemble into different types of tissue, or carry out functions critical to an organism’s health and well-being. Cell adhesion is now being used to incorporate biological cells into simple devices, but is expected to be important for the future production of complex nanotechnology devices. To date, researchers have been attaching cells to surfaces using the array of cell adhesion proteins that Nature has provided, especially the proteins known as integrins. A surface will be laid out in a desired pattern with chemical handles called “ligands” to which the integrin-coated cells will bind. However, integrins are cell adhesion generalists, just about all of the different types of cells will stick to the same ligands. This makes integrin-coated cells ill-suited for applications that require precise patterns of multiple cell types. The authors behind the Angewandte Chemie paper have solved the problem with the creation of a highly selective cell adhesion system that uses single-strands of synthetic DNA to fasten the cells to a surface. This enables different types of cells to be selectively targeted and attached to specific locations on a surface based on the nucleotide sequences of the single-stranded DNA. “We can pattern a surface with single-stranded DNA containing a specific nucleotide sequence, then coat cells with single-stranded DNA that contains a complementary sequence,” said Chandra. Whereas the mounting of single-stranded DNA on the surface of a chip and using it as a probe to identify genetic matches is a well-established technology, this is the first time that single-stranded DNA has been attached to the surface of a biological cell. Chandra and his co-authors accomplished this feat through the adaptation of a technique, developed earlier by Bertozzi and her research group, called the “Staudinger ligation.” Bertozzi’s Staudinger ligation utilizes the sugar complexes called “oligosaccharides” that reside on the surface of every cell, and a reaction between two types of molecules, a nitrogen-containing azide, and a phosphorous-containing phosphine, as a means of attaching probes and reagents to cell surfaces, or to link different molecules inside of the cells.